Race Review: runDisney 2016 Tinker Bell Half Marathon Weekend (6th to 8th May 2016) | JustRunLah! 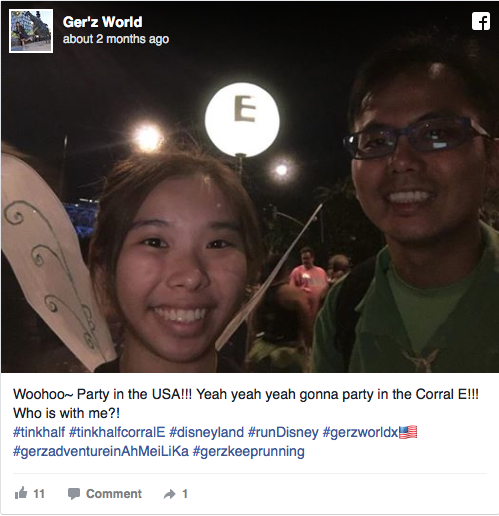 I am Gerlyn, the main blogger of Ger’z World Blog which basically shares about travelling, and running events mostly for these few years. Just to share, my blogging style over here will be more formal than what you read on www.gerzworld.com reason being is this blog will be submitted to Just Run Lah! team for review whereas Ger’z World need not, so I can’t be too singlish. See an example of writing style. JUST RUN LAH! VERSION: I AM SURE THINGS ARE NOT DONE THIS WAY. ARE YOU SURE ABOUT THIS? Anyway, what started me running is basically because of this race above. 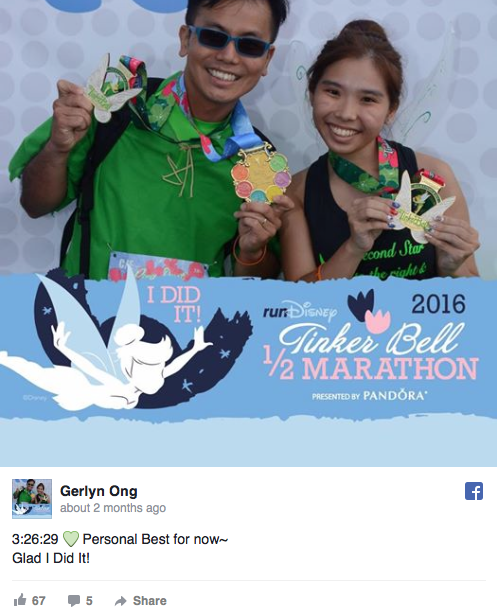 Last year my husband won a return air ticket to California (Los Angeles) from Eva Air and he loved running a lot hence I research on the runs in California and runDisney popped out in the usual search engine results. 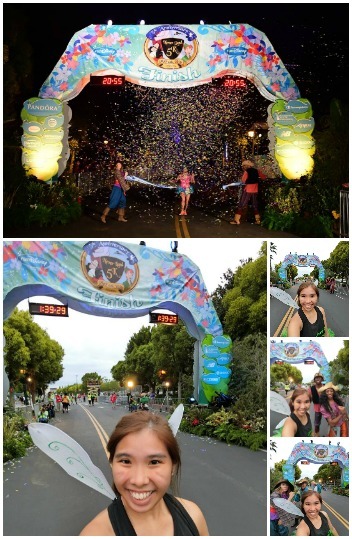 As someone who hardly passed her NAPFA test 2.4km run in Secondary School, the last run I did before signing up for this is the Hello Kitty Run in 2014 which claims to be 5km! I think maybe about 3km only for that particular year because it’s exceptionally short. For full grandmother story on how to register, please visit my blog. It’s too lengthy because there is too much drama during the registration. Now I will start reviewing the race pack collection. 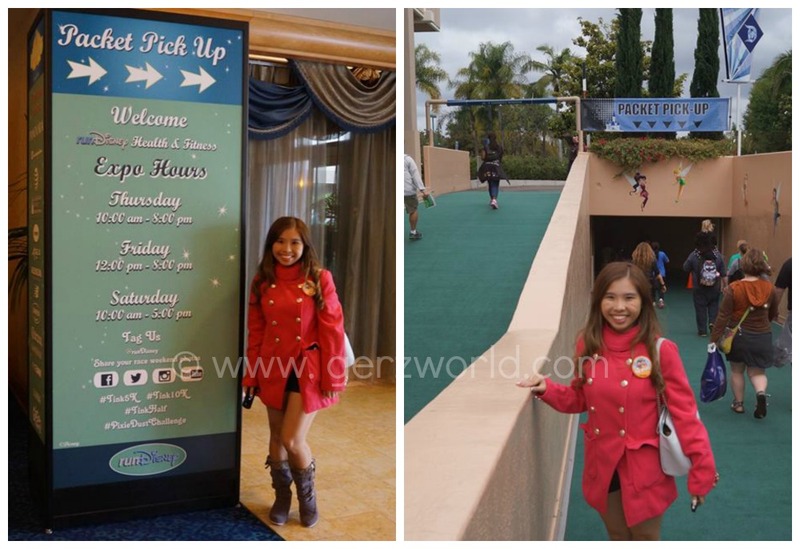 The expo is located at the convention center of the Disneyland Hotel. Race pack collection is called Packet Pick up over here. 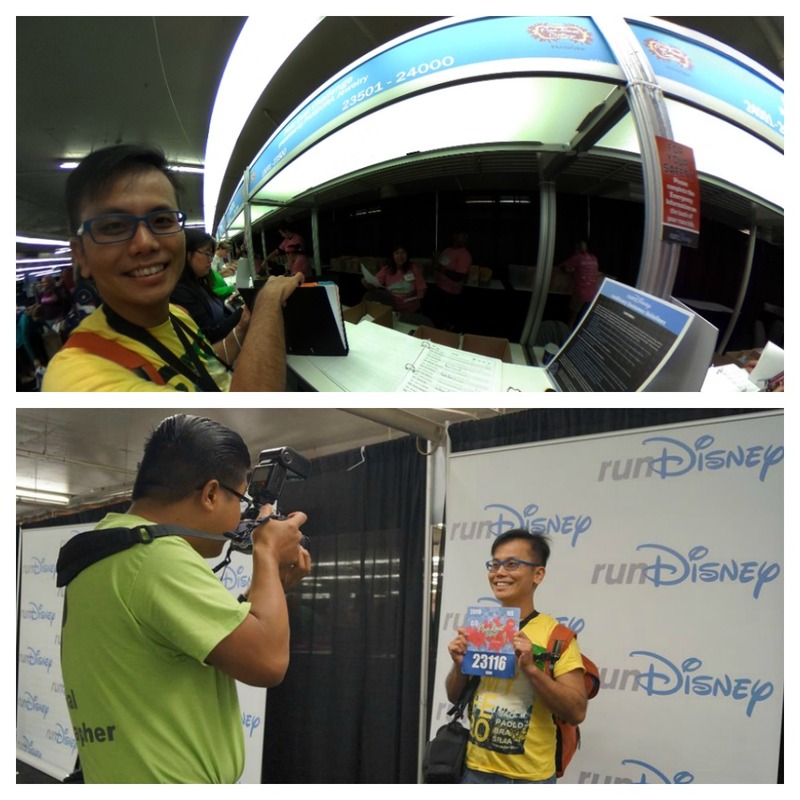 The one thing about runDisney races is that they do not allow others to pick it up for you hence you must be here personally. 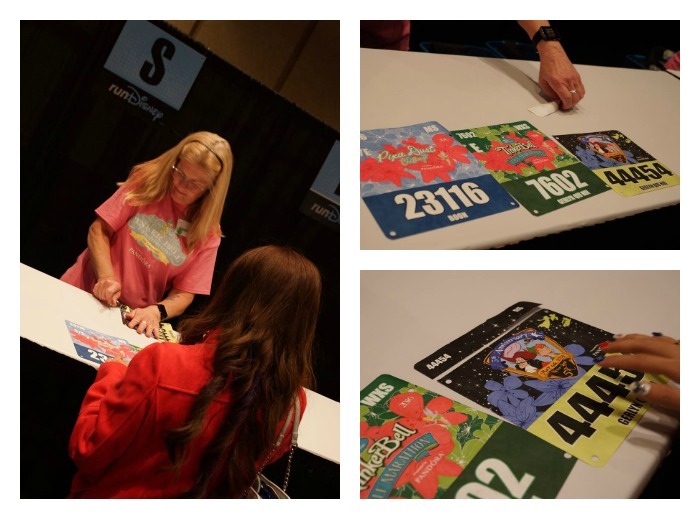 When I picked up my racing bib I got a total shock. Why? There is very little people and technically no queue. 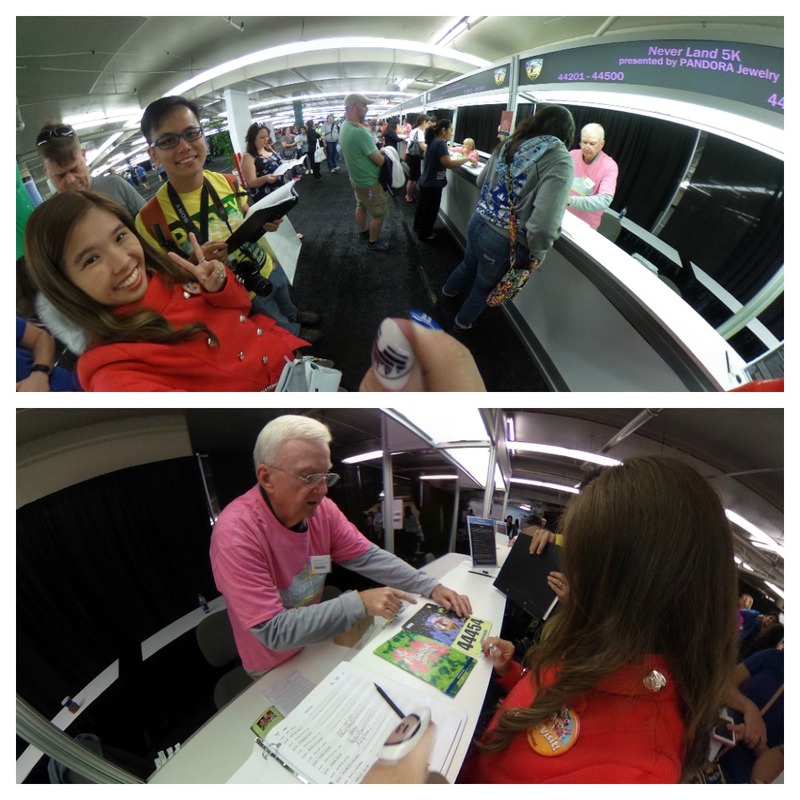 runDisney is very organised, each group of number to one booth and one booth has one volunteer. E.g: Bib no. 7600 to 7700 to one booth. But another shock I have is that the bib is the only thing I could collect here. What about the other merchandise such as running tees? They must be collected somewhere else. I particularly like this friendly volunteer. He is extremely helpful with directions and gave us a warm welcome to California and of course Disneyland. 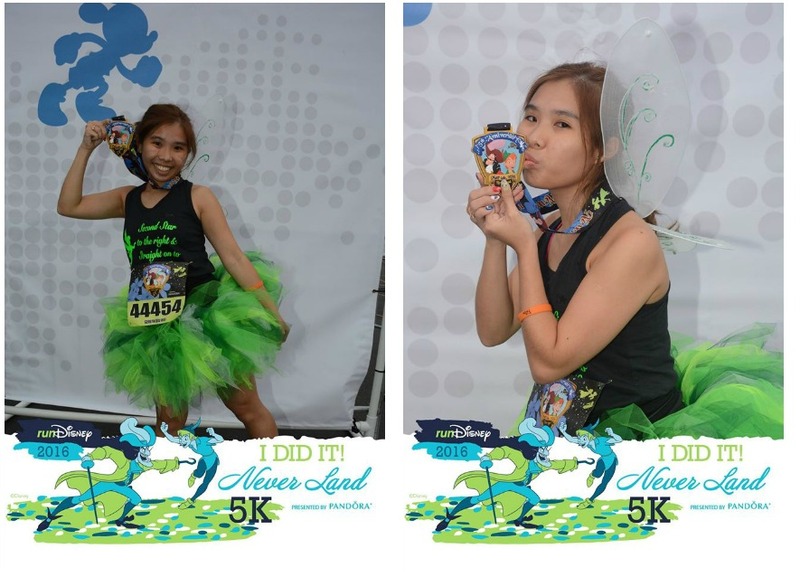 I will be doing 2 races this weekend the Never Land 5km and Half Marathon. 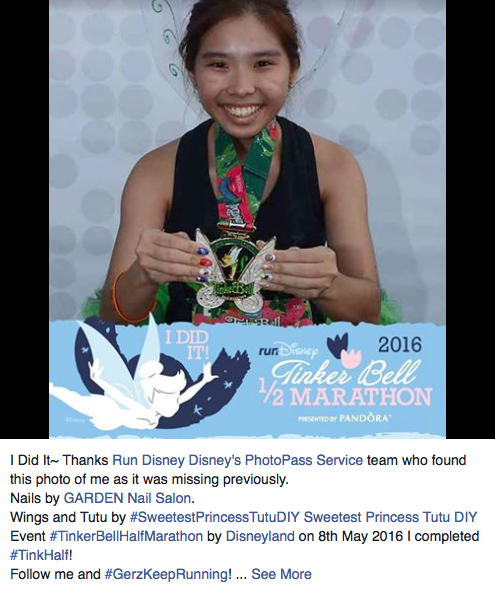 Boon Hee will be doing 10km and Half Marathon which is also known as the Pixie Dust Challenge. Okay. Now we need to proceed one level up to get our merchandise. The volunteers here will tear out the upper portion of slip from your bib in exchange for the official t-shirt. Next up is shopping time! The best part of this race is shopping! I got myself tons of nice merchandise which is expensive, probably leaving there to collect dust but you know it’s worth it! Ahhh, never mind, the husband will foot the bill you know? The best thing about this race is meeting my running Idol, Mr Jeff Galloway. He is an olympian runner and he is the founder of the RUN-WALK-RUN training method which allows me to run a half marathon in a short span of 2months. 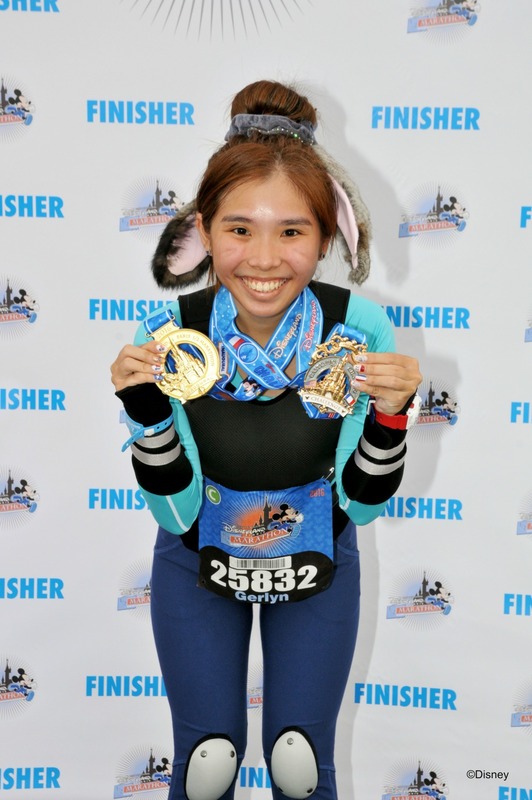 I started training on 26th February 2016 for my half marathon and 2XU Compression Run Singapore, was on the 3rd April 2016 and I completed it with a timing of 3hrs 30mins 11secs which I think is quite good for someone who fails her 2.4km run! I am proud of myself. HAHAHAHA! 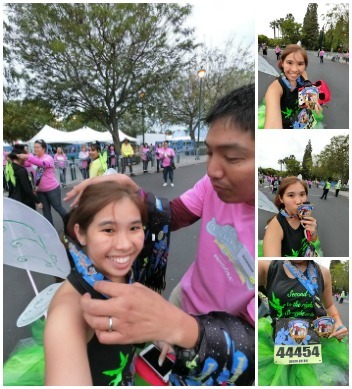 This is my OOTD, Tutu, T-Shirt and Wings from Sweetest Princess Tutu DIY (non-sponsored). It cost about $80-$90 in total. I ordered them last year hence I can’t remember the price. 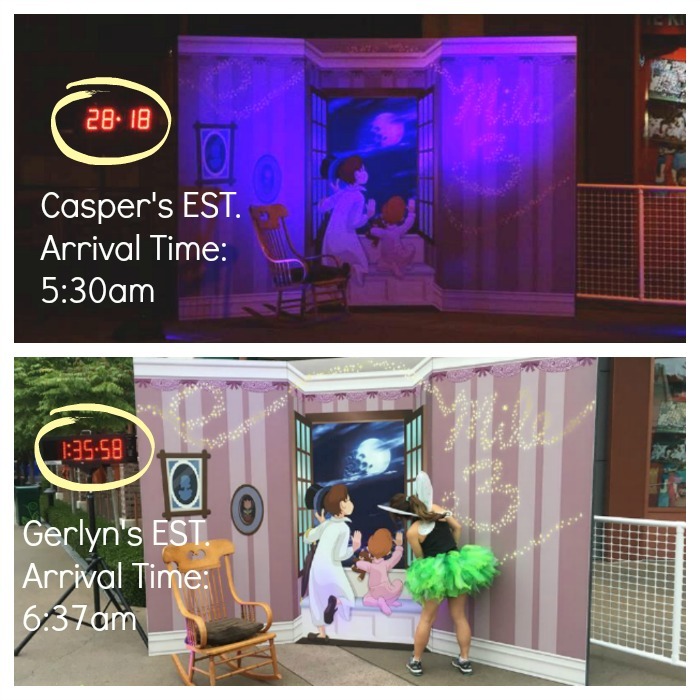 I am located at Corral C when I arrived inside Disneyland and I am super lucky to stand right in front of the Sleeping Beauty Castle and able to see Tinker Bell fly above the castle. It’s a very touching moment. 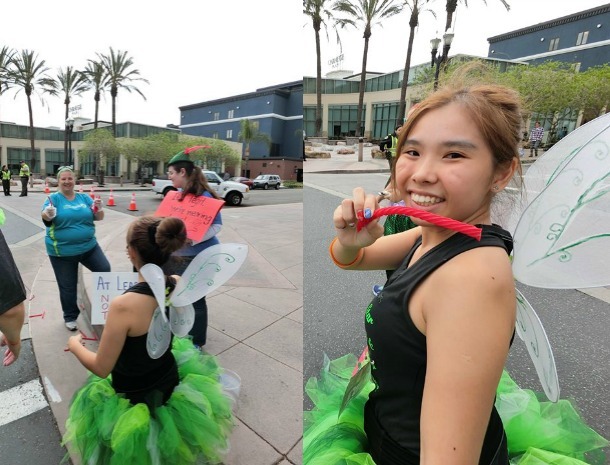 For this 5km run I took almost 1hr 45mins to complete it reason being is that I dropped my Tinker Bell Half Marathon Headband and I actually ran back 1km to find it. But eventually stopped by the security guard as it’s too dangerous to run against the human traffic. I was pretty upset but a helpful online friend went back to the expo and bought the exact same one for me. So I am happy again! 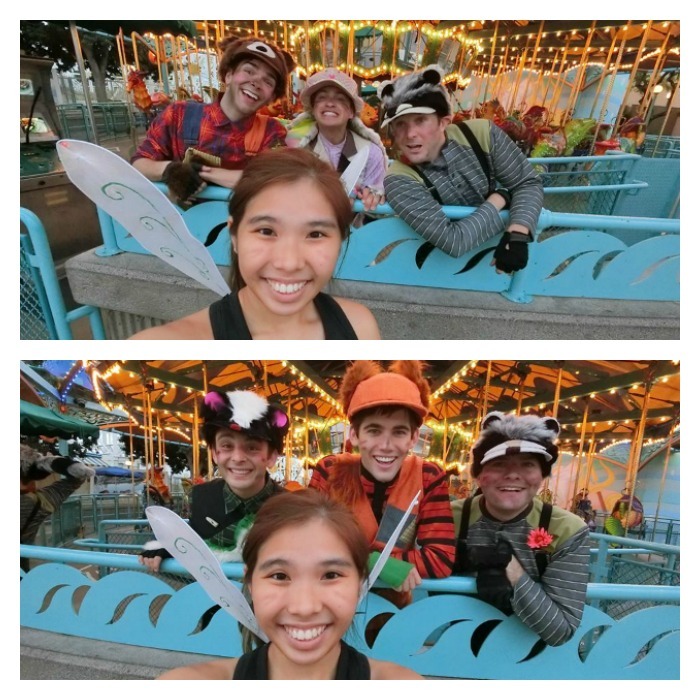 Official characters I met on course are the Lost Boys from the Never Land which is Wendy’s brothers and Peter Pan’s friends. Character queues are always this long, this is the shortest queue I have seen. I will recommend not to queue for the timed race because you will spend a lot of time and at risk of being sweep. *Sweep* means you will not get your medal and being ask to take a bus back. 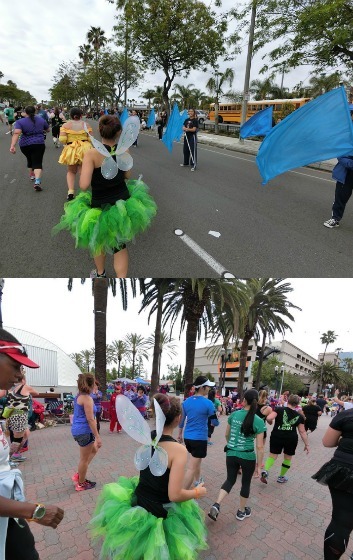 In my blog post you will frequently see the word “sweep” because slow runners like me always will meet “sweepers” along the race course once or maybe twice. They are like my BFF! 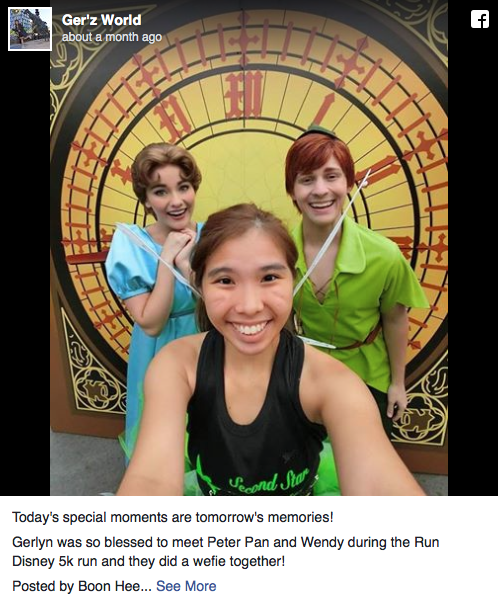 Finally my patience paid off when I saw Wendy and Peter Pan. 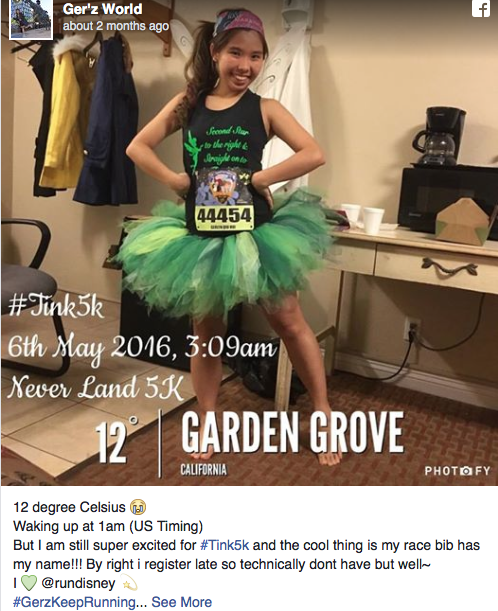 I think you must be wondering how these nice running photos were taken. It was taken by the photopass photographer. They were station in green tentage in various spots within the parks. 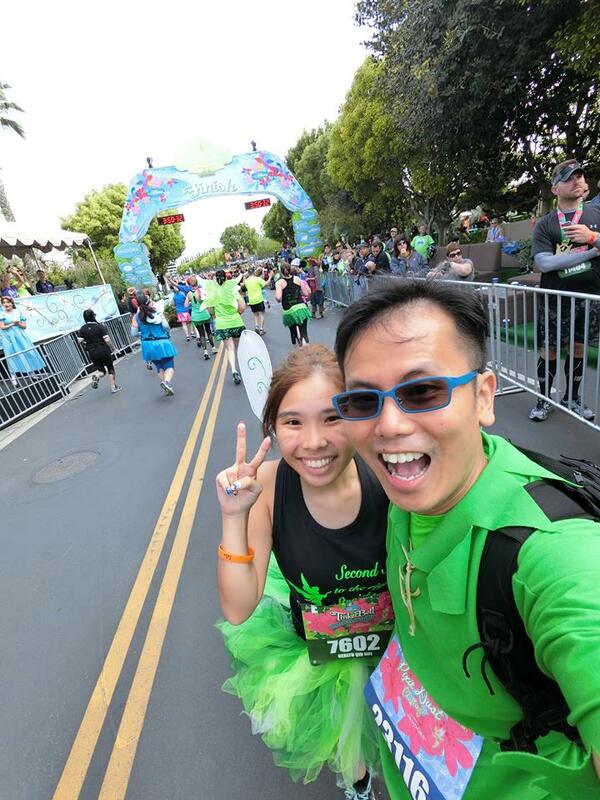 Photos are available @ $39 USD per day / per race. You can choose to view and not to buy but it will have watermarks on them. 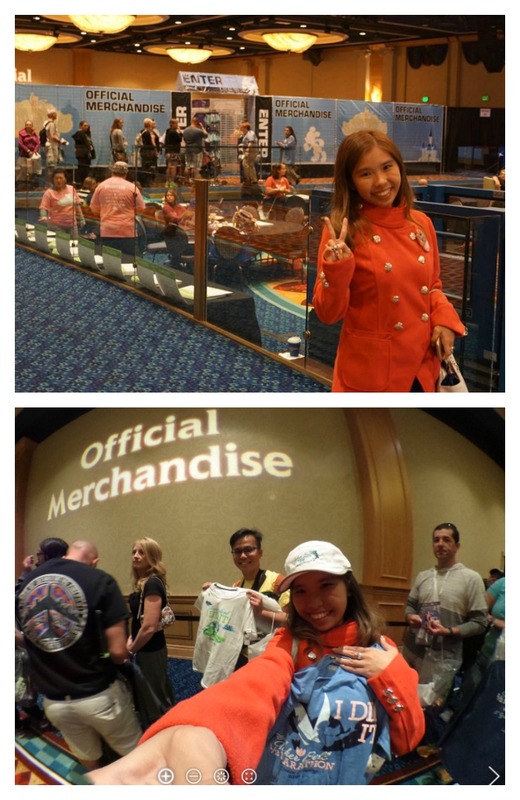 I think $39 USD is kinda pricey when most race in Malaysia and Singapore are giving photos for free on Facebook Albums. 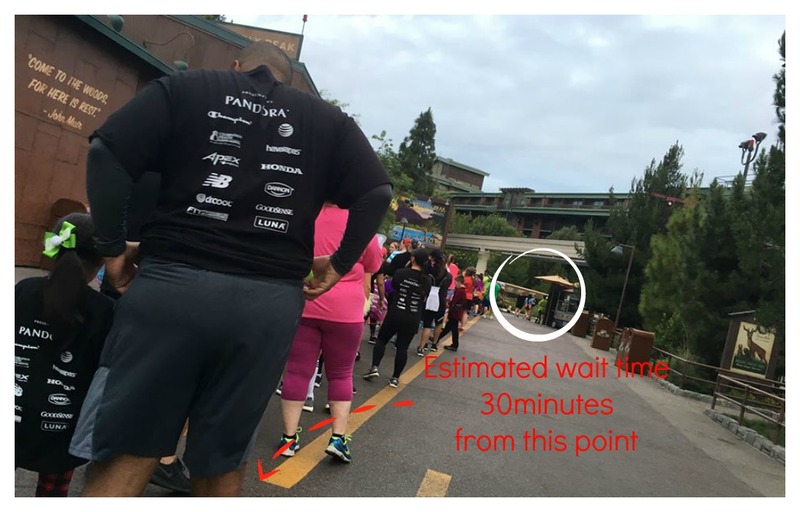 But well, this is how runDisney makes money! For the entire race registration, we spent about $900 USD for both me and Boon Hee so $39 USD will seems very little to this big amount. I wonder how many blogging assignments I have to take to recoup this amount back. HAHAHAHA! The very nice and awesome husband, actually stood here and waited for me near the Mile 3 marker. He waited for almost an hour for me to complete. This action really touched my heart because it’s my first solo run alone, then I also lost my stuff, feeling upset and depressed but you know someone is there waiting for you. Casper did not realised that I lost my headband and I told him my story and then I cried again. Just angry with myself how come I am so careless and don’t even know I dropped my stuff and how come I can’t even look after my own stuff. 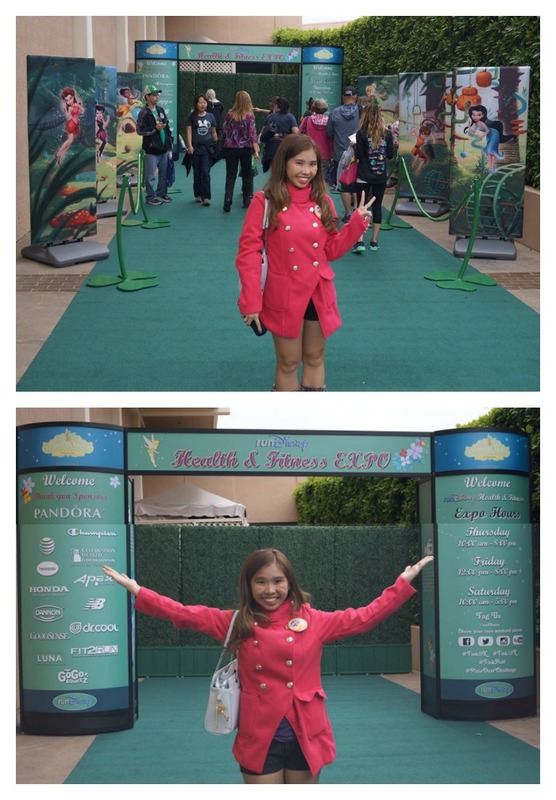 But supportive husband went back to EXPO and even Disneyland Lost & Found to find it but no news of my missing items. #BestHubbyAward should be given to him! Crossed the finish line! Proud of myself not because of the timing but because I completed it alone and even though I am upset. It took me 2 days to snap out of this incident because I am someone whom I consider very careful and always take good care of my stuff and hence I kept blaming myself when such things happen. 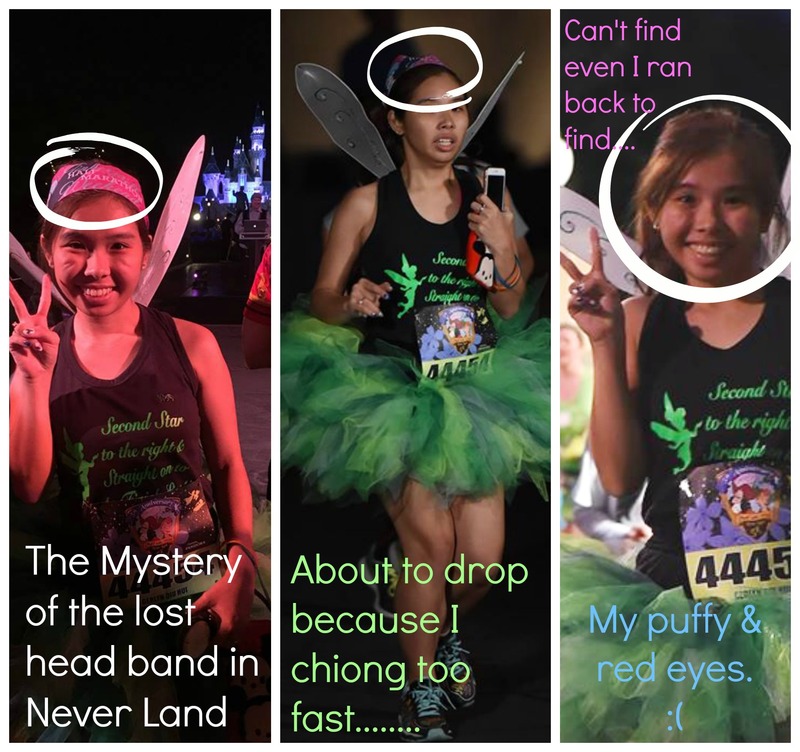 Maybe when you are reading this blogpost you will be thinking, “This girl keeps talking about her headband non-stop.” I apologise for keep harping on this but for the whole 5km, all I think about is my missing headband which is true. I want to share my most genuine feelings with all my readers. That’s my aim for blogging all these while. Collected my runner’s refreshment pack, consist of Chips, Cheese, Gogo Apple Sauce, Oreo, wet wipes and a Chocolate Energy bar. 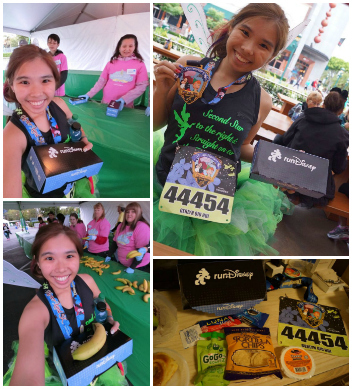 Official finisher photos taken by the Photopass Photographer this is part of the $39 spent for the photos. Whatever’s on the bed cost $90 USD. Finisher T-shirt not inclusive, which is $26.90 USD if I remember correctly. The medal is a plastic medal too. My first plastic medal and the most expensive plastic medal I ever owned! 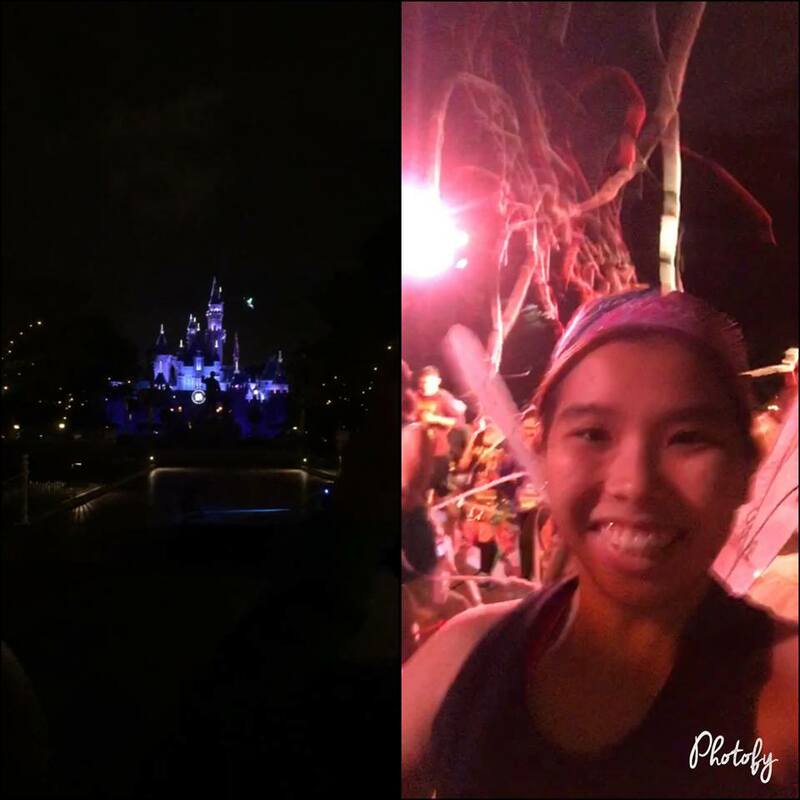 $90 USD for a 5km run is expensive but remember… You get to enter Disneyland, run in Disneyland without an $100 USD admission ticket!!! 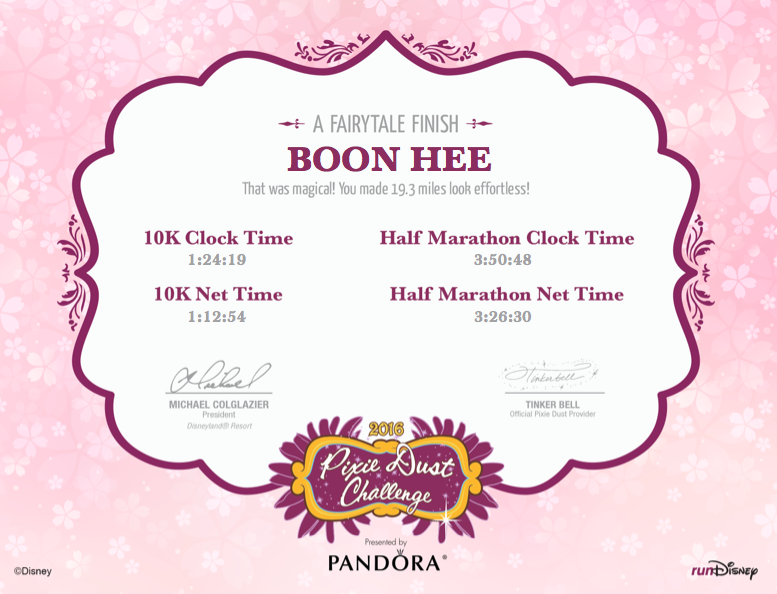 Basically is the same as 5km but I wore a Brooks capri pants to avoid abrasion between my thigh and the TUTU. 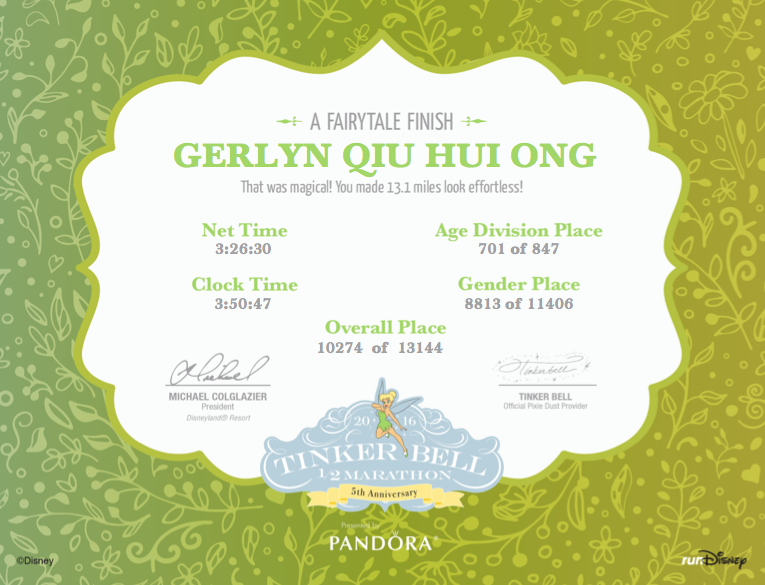 We are the only Singaporean in the run and the first Singaporean in the entire Tinker Bell Half Marathon History. It’s only when you are away from home then you feel those sense of pride as a Singaporean. We are in Corral E.
We are allocated to Corral E because we did not submit any proof of timing to request for a nearer Corral. Corral E is the second last corral the benefits on being in an earlier corral is that you are further away from the “sweeper” as the sweeper will start 5mins after the last runner in Corral F. Sweeper will maintain a speed of 16mins/mile (aprox. 9mins 56secs/km) and if you lag behind then goodbye to you. 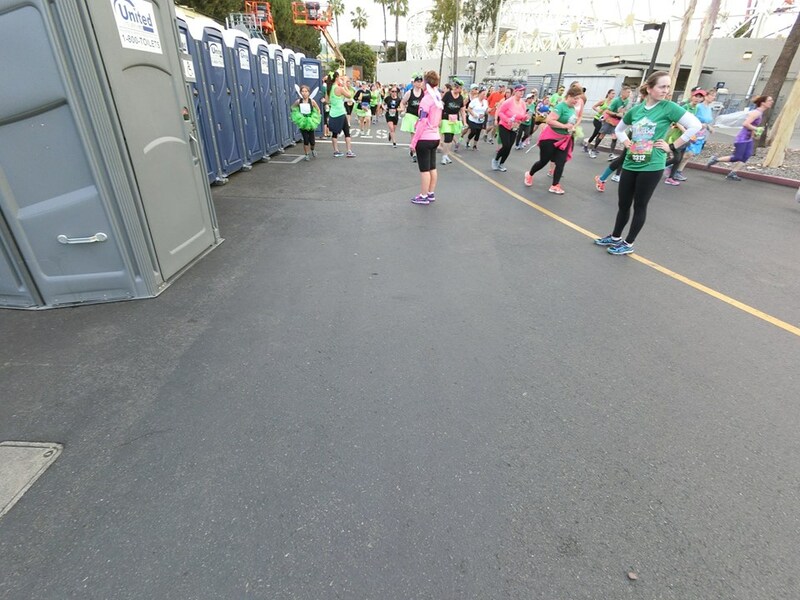 What I really liked about runDisney is the amounts of toilets they have is just too much! There isn’t really a queue and it’s very clean. Almost every mile has a toilet which is good for pregnant ladies. Did I mentioned there is a lot of pregnant ladies in the run? 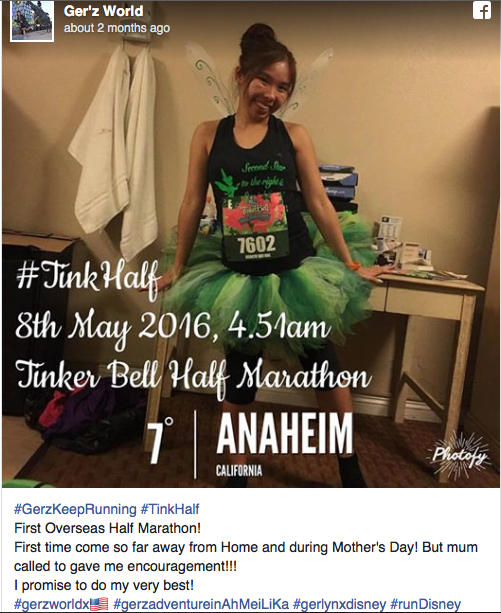 I would totally runDisney if I were pregnant too! You don’t have to worry about toilet and there is medics and volunteers around you. Water points are also very close to each other. Everyone is very helpful. 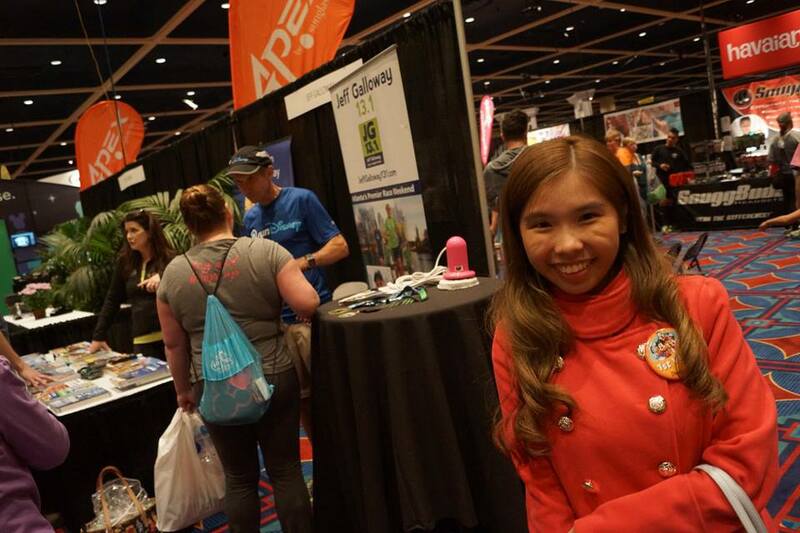 No need to talk about running etiquette because everyone is so courteous and nice and friendly which makes you automatically blend into the good running culture. After we left the Disneyland premises, I was a little down but very soon I was really shocked by the members of public! School band actually performed to cheer us and cheerleaders were there to encourage runners. It’s something I never experienced before. A friendly lady even gave all runners FREE LIQUORICE to perk us up! It’s my first time eating liquorice and I am surprised that it taste pretty awesome! 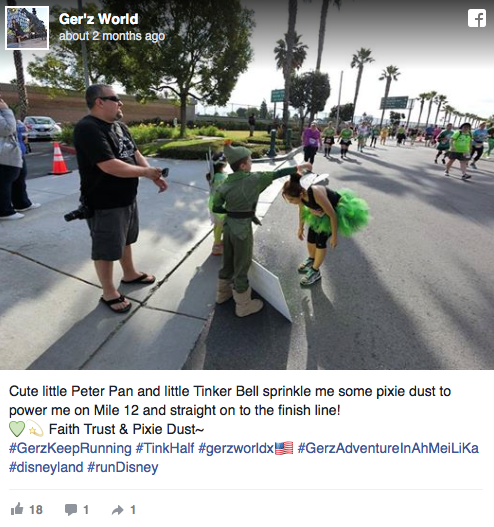 A fellow Mommy runner got her husband to bring along her child to sprinkle free pixie dust because all fairies are powered by Pixie Dust. I feel so much warmth in this lovely country. My future kids is so gonna do this too! We have reached the finishing line. But first let me take a selfie! Together we crossed the finishing line! 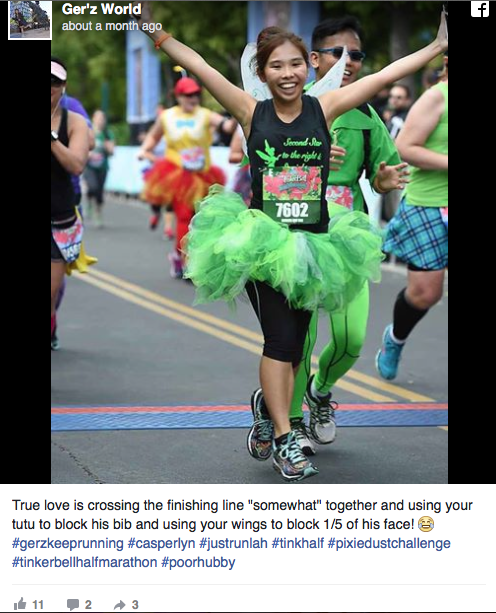 It’s so cool to be running with your love ones! 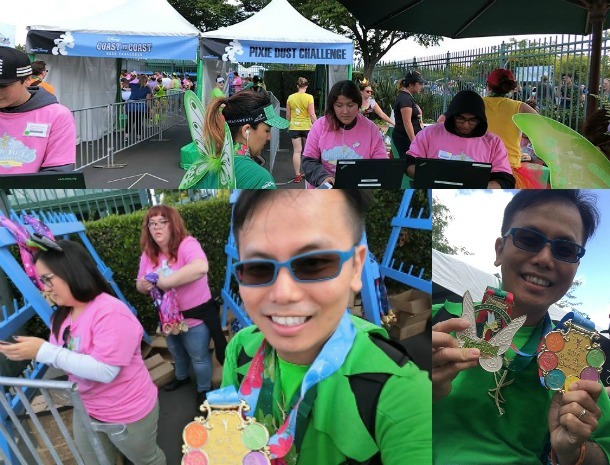 Successfully gotten our long awaited medal. This year’s medal is the 5th anniversary medal and it’s beautifully painted with colours. 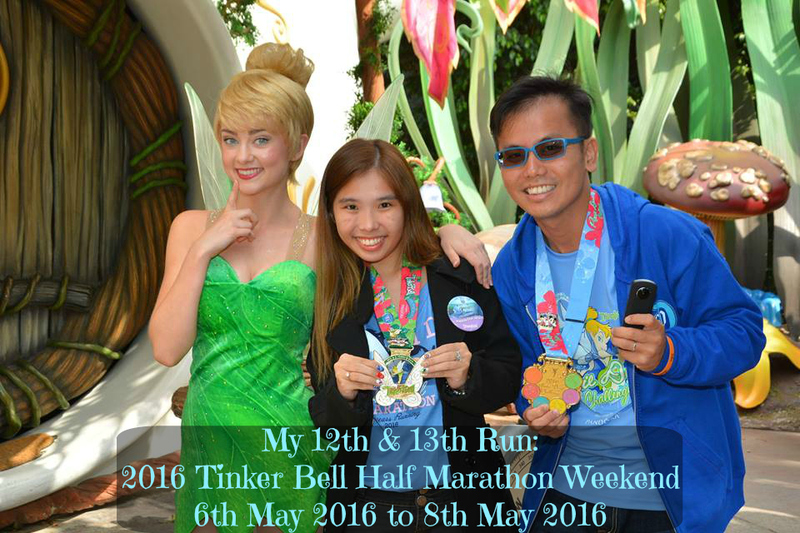 Running from 2012 to 2016, 5th Anniversary for Tinker Bell Half Marathon! 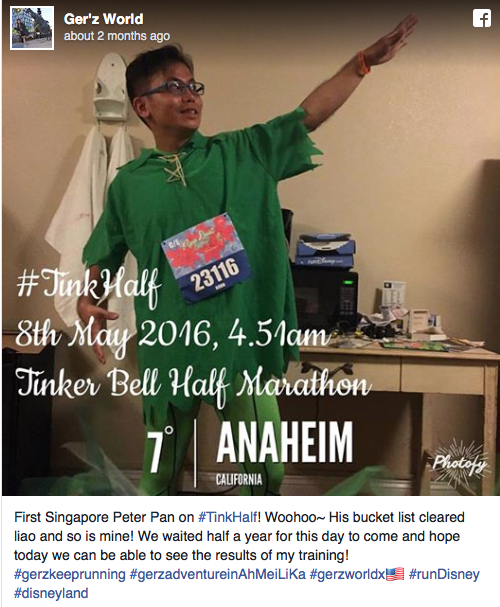 Casper also successfully gotten his Pixie Dust Challenge Medal too! This photo was missing from my photo package and then the Photopass team actually spent some time to recover this photo for me. 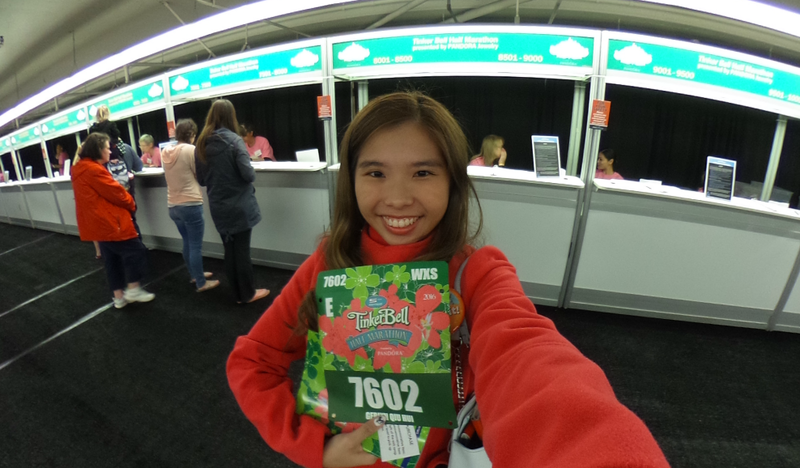 I suspect is the border actually blocked my bib number hence they did not tag this photo to my bib. 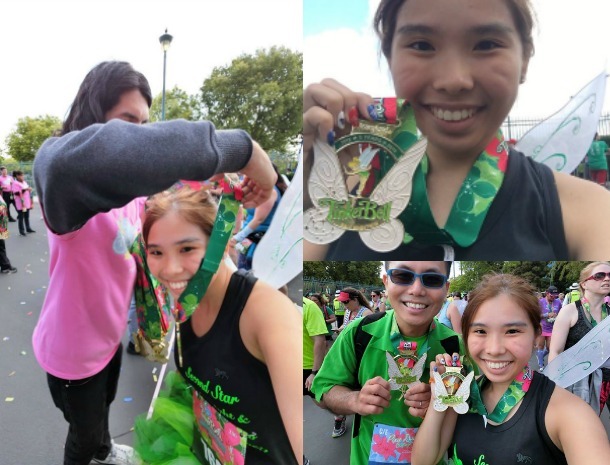 It is pretty amazing that we completed my First Overseas Half Marathon together. I am glad to be running with you. I shall share with you our very beautiful e-certificate! 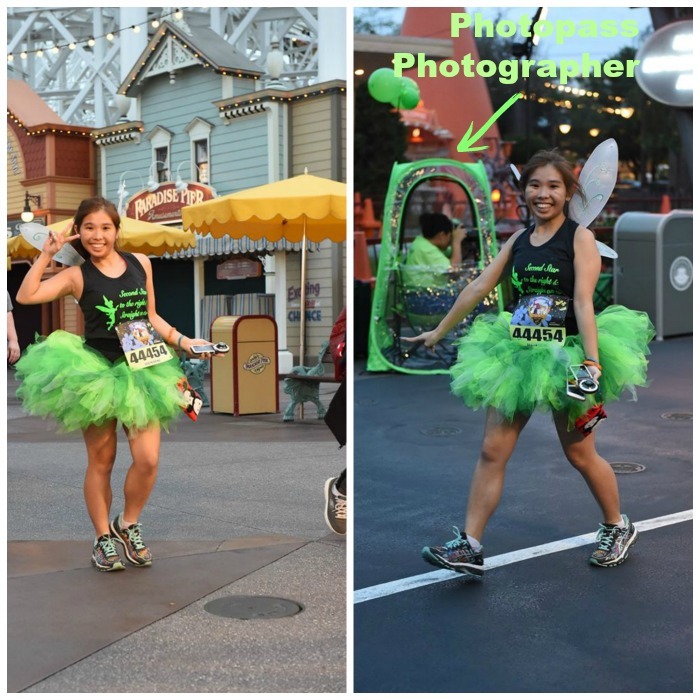 This pretty much sums up my experience for the Disney’s Tinker Bell Half Marathon! Let me know on Facebook “Ger’z World” if you like my writing or you think there is room for improvement. I am very much open to suggestion. Till then we shall run again! For funny conversation and grandmother story, please see here.